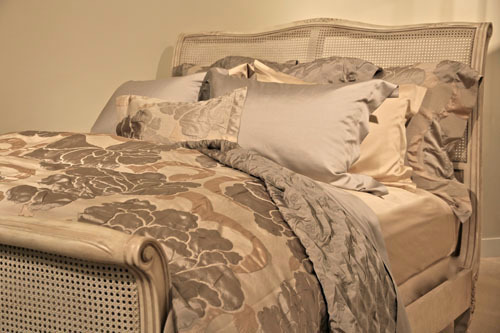 Platino luxury bedding from SDH Enterprises is an exquisite, all-natural bedding line that is brushed with color. The collection is a 4-color yarn dyed jacquard weave of 58% Silk and 42% Egyptian Cotton. Available in Duvets, Top Sheets, Fitted Sheets, Cases & Bedskirts, this collection is OekoTex certified. Products with the Oeko-Tex label are tested and guaranteed to be free of all harmful substances, including toxins and irritants – making sure that the fabrics in your home and safe, natural, and healthy. SDH Platino is offered in 2 colors: Rosewood and Terra.